Back at the MarTech conference in San Francisco this past March, we conducted a study of marketing technologists with SapientNitro. After analyzing the data, Sheldon Monteiro, the global CTO of SapientNitro, and his team finally released their report from that research this week. It’s a terrific report — well worth the wait! It reveals a number of insights into the evolution of our marketing technologist profession. More marketing technologists (44%) now report to the CMO. The number of professionals in the space who have “marketing technology” in their official job title is growing (16%). And — perhaps surprising — more than half of marketing technologists (55%) have a background in marketing rather than technology. One of the challenges of the study, in my opinion, is that the term “marketing technologist” has significant variance in how it’s intrepreted. For some, it is a software engineering or enterprise architecture role — closer to classic IT, but in the more specialized domain of marketing. For others, it is more of a specialized marketing operations position — for instance, the lead operator of a technically advanced, off-the-shelf application, such as a marketing automation platform. This variance makes it hard to distill common patterns across the profession. Sheldon’s editorial in the report raises some valid concerns with that dispersion of skills and responsibilities. However, I’m personally more comfortable with wider use of the “marketing technologist” label. The recognition that marketing technology management and operations can be a front-line marketing role — with staff who come more from a marketing background than an engineering background — is, in general, I think a good thing. 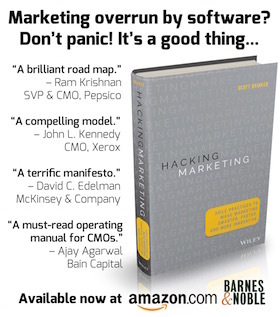 To me, it means that marketing technology is now being woven more deeply into the fabric of marketing teams at large. Which brings me to some of the most interesting findings in the study — perspectives on digital business transformation through the eyes of marketing technologists. The good news is that effectively all organizations (97%), at least of those who participated in this study, are addressing digital transformation in some way — and in the vast majority of them (77%), marketing technologists are involved in these initiatives. The theme of digital business transformation > marketing has been growing steadily this year, and the data in this report backs that up. Of course, this begs the question: what do you mean by digital business transformation? The primary driver is “transforming customer experience holistically across all channels” (56.5%) — a front-office mission — followed closely by “transforming operational processes” (54.3%) in the back-office. Now, our survey found that the CMO is the executive most likely to be responsible for the oversight of digital business transformation (26%), followed by the CEO (22%), and then the CIO/CTO (13%). In a few cases, the chief marketing technologist takes the lead (6%). But there’s clearly a plurality of leadership roles here. Even if marketing is the catalyst for digital transformation, it’s only the official leader of those initiatives 1/4 of the time. I’m hesitant to assign a value judgment to that yet — which is the “right” way to tackle digital transformation. My impression is that the best approach is highly contextual to each particular organization and, very often, the individual leaders in these roles at this point. But I believe that this is not a one-time project, and that ultimately, companies need to approach transformation as an ongoing way of life in an ever-changing digital world. 64.8% of the participants agreed that digital transformation was being driven by customer insights — although only 23.1% strongly agreed — which is a good reason for marketing, as the internal champion of the voice of the customer, to play a crucial role in these efforts. However, when you look at the leading obstacles above — conflicting priorities (38%), lack of resources (35.2%), lack of organizagtion alignment (29.6%), etc. — it becomes clear that marketing cannot do this alone. It is digital business transformation, not merely digital marketing transformation. Only 1 in 10 of the participants in our survey said that their organization is currently structured to deliver a seamless customer experience across all customer touchpoints. For more data from the study, download a copy here. I’d love to hear your thoughts.